In comics Thor's hammer was forged in the heart of a star. But a magic hammer is pretty tame compared to some of the things that really get forged in the heart of a star. Above: If you'd like one, this is how. Neutron stars are one of the things the core of a star can become when it goes supernova: The star runs out of fuel, and the outer layers collapse, heating up to incredible temperatures and bouncing off the core itself. 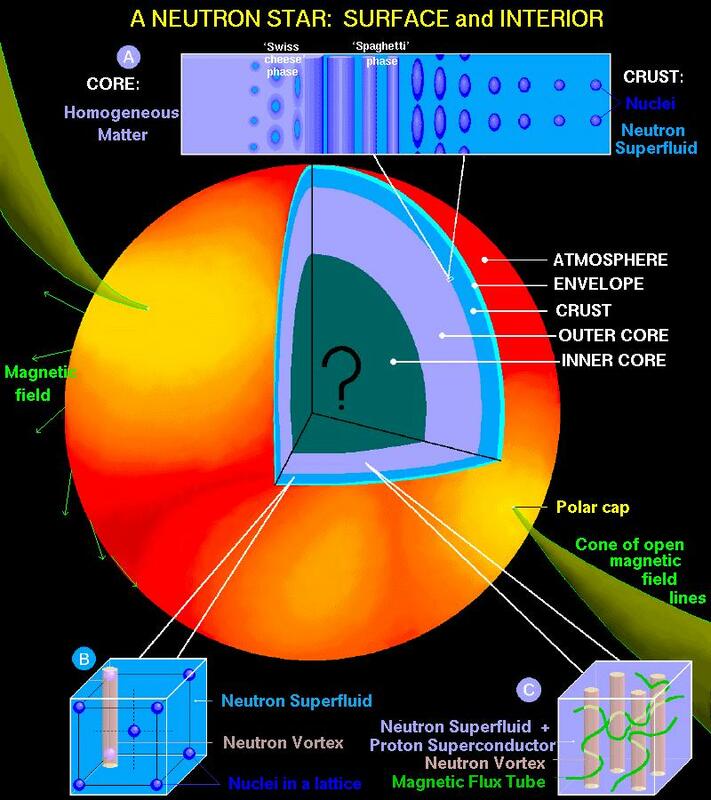 The core is subjected to indescribable temperatures and pressures, and is turned into what is basically an 11km wide atomic nucleus, spinning at about 15% of lightspeed**. Above: An infographic showing the surfce and composition of a neutron star. The gravity at the surface is hundreds of thousands of times stronger than Earth's. Time would slow down significantly, thanks to gravity and rapid speed. Land there and you'd literally be crushed by the weight of your own hair. This is what happens when a supernova goes wrong: As the neutron star forms the energy of the supernova goes straight into charging its magnetic field (the same mecanism happens when neutron stars collide, making even stronger fields). As a result it's magnetic field is thousand trillion times stronger than Earth's. 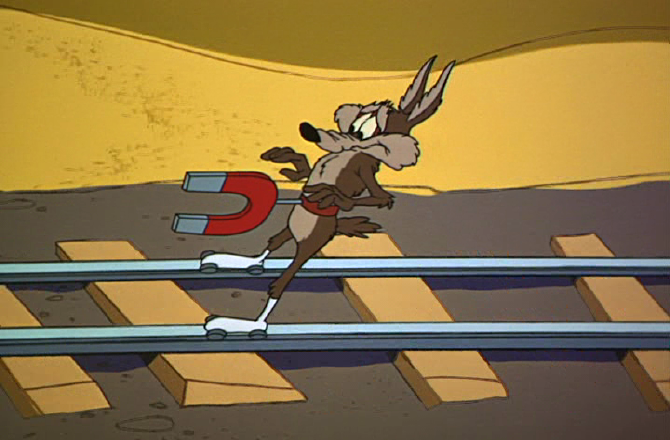 That's even stronger than an Acme magnet. This makes magnetars very, very interesting to physicists: They combine the some of the universe's strongest magnetic fields with some of it's strongest gravitational ones, pushing physical laws to breaking point. To get some idea of what such a place would be like, let's imagine we've dropped a spaceship containing Major Tom (of the David Bowie song), on a trajectory down towards one. We start him at twice the distance from the Earth to the Moon. Exactly how far from the magnetar the following things will happen depends on just how strong and how heavy it is, but where I can give an approximate number I have. At two lunar distances (1 lunar distance, or L.D. = the same distance as seperates the Earth and Moon) the magnetar shines as a point of intense blue light - it's surface is over a million degrees kelvin, much hotter than our Sun. Most of it's light is actually hard UV. Even this far out it's giving off a lot of radiation, but for the purposes of Tom's flight let's assume we have perfect shielding - else he'll be dead before any of the really interesting stuff happens. The gravitational field is already stronger than that at the surface of our Sun, so Tom's ship picks up speed fast. 2 L.D. down to 1 L.D. Tom's computer systems get increasingly glitchy. 1 L.D. Tom's credit card will be wiped by the magnetic field. More importantly, so is his ships computer. The electric impulses in Major Tom's nervous system start to go haywire. I imagine it will start with the sensitive functions of his higher consciousness - He'll start to hear things, see things, feel strange sensations. In fact he may have been feeling some mild effects - headaches, nausea - for a while now. At the same time the clouds of electrons that make up the outer layers of atoms start to distort under the field, changing how chemistry works - not a lot yet, but enough: Some kinds of chemical bond are starting to form slightly more easily parallel to the field than across it. Tom's biology is based on very precise and subtle chemical balances - so Tom's biochemistry and cellular mechanisms start to shut down or malfunction. The iron in Tom's blood starts to be influenced by the field. His blood now flows more easily parallel to the magnetic field than perpendicular to it, making it harder for it to flow properly overall. Although his heart's already stopped so he doesn't care. Approaching the 1000 km mark: Water has a small diamagnetic property. Tom is mostly made of water, which the field is inceasingly pulling on. I'm not clear which would have the bigger effect faster - the relatively small amount of very magnetic iron, or the large amount of slightly diamagnetic water. Either way, Tom is being stretched by the field. As the ship cuts through magnetic field lines huge currents are generated in everything that's even slightly conducting. Plastic burns, metal melts, and the ship falls apart. 1000 km: The laws of chemistry have broken down or changed beyond recognition. The electron clouds around atoms are stretching into tube shapes, making normal chemical bonds impossible: What little is left of Tom and his ship gets disintegrated at the molecular level. So, Tom never makes it to the surface: What remains of him strikes neutron star's blue hot, 15cm deep, atmosphere as a cloud of plasma traveling at an appreciable fraction of lightspeed, and the last trace of him is gone. Time is slowed by half. Space itself has become birefringent, only allowing light to pass through in certain directions. Atomic nuclei are stretched into rod shapes, electrons are no longer sticking to them, and all semblance of normal chemistry is gone. Protons and neutrons form shapes resembling minute versions of pasta - sheets, twirls, penne like masses filled with tunnels. The magnetic field makes the crust buckle and release immense fireballs from the interior - and then the field freezes the fireballs in place, hanging them over the surface. Such a fireball, from a passing magnetar, might even have been he cause of a mass extinction on Earth. 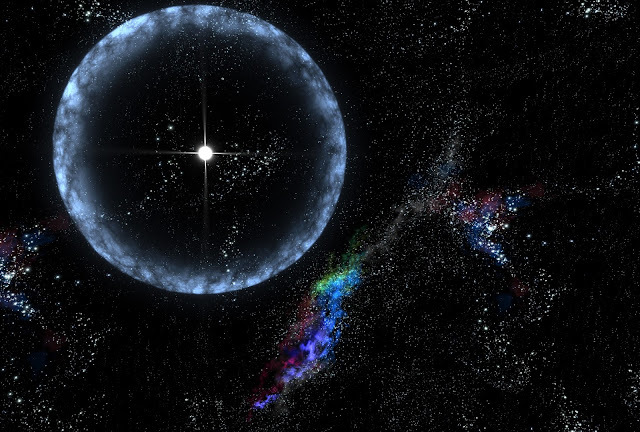 Above: An artists impression of the expanding radiation shell from a magnetar flare. Courtesy of wikpaedia. This, at least, is a tomb worthy of one of David Bowie's creations: It's an 11 km wide atom-core-super-magnet. Space and time themselves change and warp arund it, and the very laws of nature are unrecognisable. It's so strange here that neither an astronaut, a space capsule, or normal matter can even exist. And, even after it's cooled and it's magnetic field faded, the neutron star will last for as long as our universe. * You think I'm making this stuff up? No one could make this stuff up. No-one outside of an insane asylum anyway. Hold on, it's gonna get weirder.